NEW ORLEANS Former NFL Commissioner Paul Tagliabue overturned the suspensions of four current and former New Orleans Saints players in the league's bounty investigation of the club. Tagliabue, however, found that three of the players engaged in conduct detrimental to the league. He said they participated in a performance pool that rewarded key plays  including hard tackles  that could merit fines. But he stressed that the team's coaches were very much involved. "Unlike Saints' broad organizational misconduct, player appeals involve sharply focused issues of alleged individual player misconduct in several different aspects," said a portion of ruling released by the NFL. "My affirmation of Commissioner Goodell's findings could certainly justify the issuance of fines. However, this entire case has been contaminated by the coaches and others in the Saints' organization." Tagliabue was appointed by his successor, Commissioner Roger Goodell, to handle a second round of player appeals to the league in connection with the Saints' cash-for-hits program run by former defensive coordinator Gregg Williams from 2009-2011. The players initially opposed his appointment. Saints linebacker Jonathan Vilma had been given a full-season suspension, while defensive end Will Smith, Cleveland linebacker Scott Fujita and free agent defensive lineman Anthony Hargrove each received shorter suspensions. Fujita was the only player cleared of conduct detrimental to the league by Tagliabue. None of the players sat out any games because of suspensions. They have been allowed to play while appeals are pending, though Fujita is on injured reserve and Hargrove is not with a team. Shortly before the regular season, the initial suspensions were thrown out by an appeals panel created by the league's collective bargaining agreement. Goodell then reissued them, with some changes, and now those have been dismissed. Meanwhile, the players have challenged the NFL's handling of the entire process in federal court, but U.S District Judge Ginger Berrigan had been waiting to see how the latest round of appeals played out before deciding whether to get involved. With the player suspensions overturned, the end of a nearly 10-month dispute over how the NFL handled an investigation that covered three seasons and gathered about 50,000 pages of documents could be near. NFL investigators found that Vilma and Smith were ring-leaders of a cash-for-hits program that rewarded injurious tackles labeled as "cart-offs" and "knockouts." The NFL also concluded that Hargrove lied to NFL investigators to help cover up the program. Goodell also suspended Williams indefinitely, while banning Saints head coach Sean Payton for a full season. Tagliabue's ruling comes after a new round of hearings that for the first time allowed Vilma's attorneys and the NFL Players Association, which represents the other three players, to cross-examine key NFL witnesses in the probe. 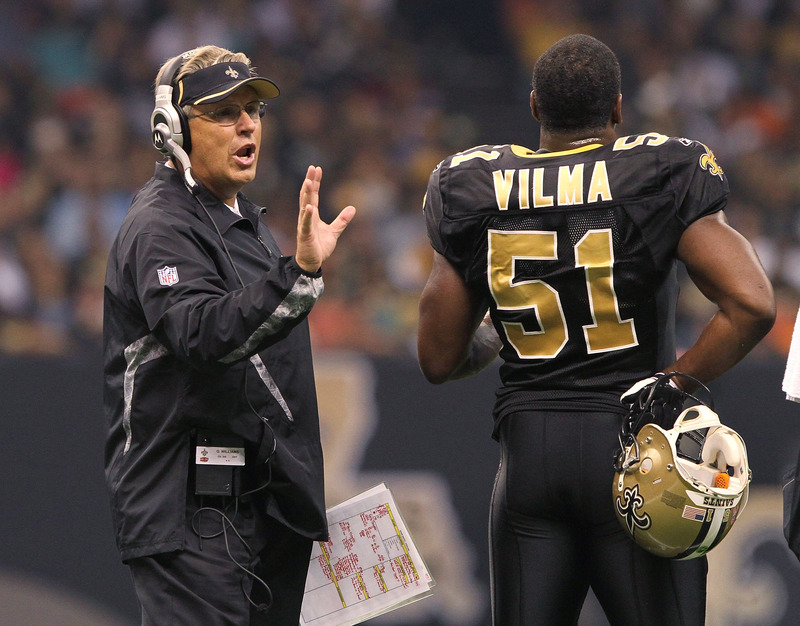 Those witnesses included Williams and former Saints assistant Mike Cerullo, who was fired after the 2009 season and whose email to the league, accusing the Saints of being "a dirty organization," jump-started the probe. Brees has been an outspoken defender of his coach and team after the NFL alleged that Saints players were rewarded for inflicting injury on opposing players. ""Despite the injustices that the league office and commissioned Goodell have committed against our team and Sean Payton specifically, I think for us, I just ask myself what would Sean want us to do and he would want us to be focused on winning football games," Brees told "Person to Person" last month.